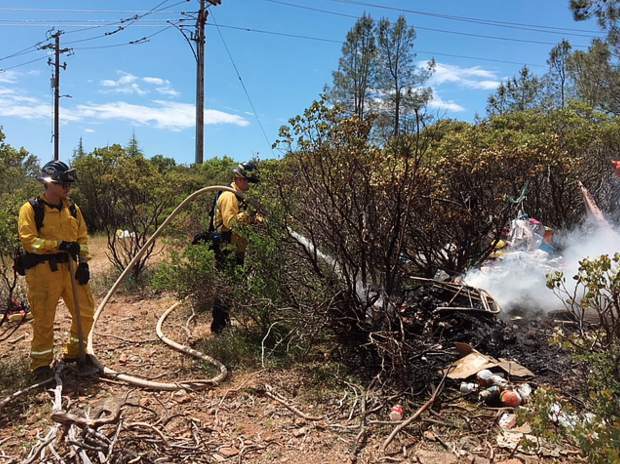 Grass Valley and Nevada County firefighters quashed a vegetation fire Tuesday afternoon located at the intersection of Dorsey Drive and Sutton Way in Grass Valley, according to a press release. Three engines responded to the scene after 1 p.m., and first responders found a large trash pile with slight extension to the vegetation burning in a transient camp. The fire was extinguished by 1:35 p.m. and held to a 10 by 10 foot area. No structures were threatened and the cause of the fire is currently under investigation. Grass Valley and Nevada County firefighters quashed a vegetation fire Tuesday afternoon located at the intersection of Dorsey Drive and Sutton Way in Grass Valley, according to a press release. Three engines responded to the scene after 1 p.m., and first responders found a large trash pile with slight extension to the vegetation burning in a transient camp. The fire was extinguished by 1:35 p.m. and held to a 10 by 10 foot area. No structures were threatened and the cause of the fire is currently under investigation.